The first change to the upcoming UFC 126 fight card has taken place. Sam Stout dropped out of the his proposed encounter with Paul Kelly in Las Vegas. While the specific nature of the injury has yet to be revealed, it has come to light that Donald “Cowboy” Cerrone will step in to take his place against the Brit. 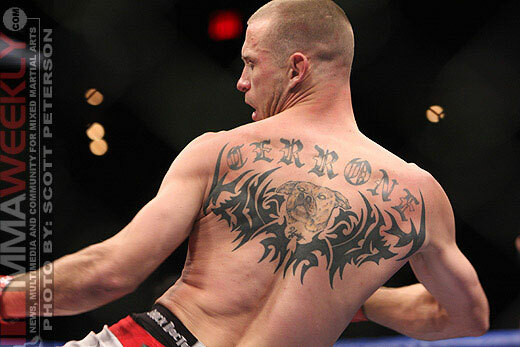 This marks Cerrone’s debut as a UFC fighter. Sources close to negotiations have indicated that contracts have been signed from the American side and are just awaiting the return of a signed bout agreement from Kelly’s camp. Lightweight fighters in the UFC have been on high alert since the announcement of the WEC integration. With bouts now starting to materialize, the lightweight division is going to be very active in 2011. Cerrone enters his UFC debut on a two-fight win streak to close out his WEC career, including a win over his rival Jamie Varner, and a submission win over Chris Horodecki at WEC 53. The lightweight bout is expected to be a part of the UFC 126 undercard taking place in Las Vegas during Super Bowl weekend.